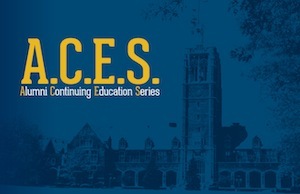 The Alumni Continuing Education Series (A.C.E.S.) is a non-credit granting, personal enrichment series offered to alumni of John Carroll as a benefit and aims to stimulate intellectual growth by connecting graduates to the academic resources of their alma mater. The series features current and former faculty and other members of the John Carroll community. Class is in session! No grades. No credit. No stress. Pure learning. Check the alumni event calendar for upcoming sessions.